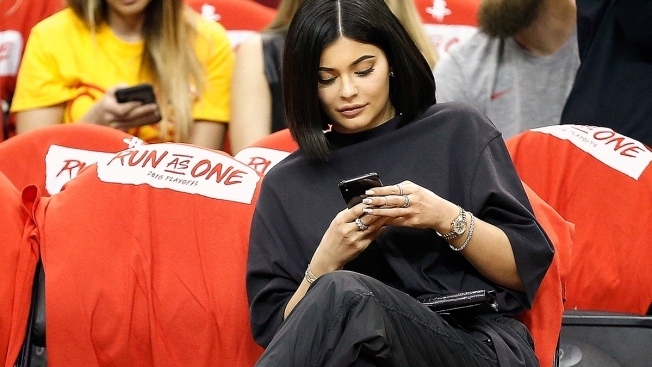 This April 18, 2018, file photo shows Kyle Jenner looking at her phone before game two of the first round of the NBA Western Conference playoffs in Houston, Texas. Kylie Jenner, you had an egg-cellent run. The 21-year-old's most-liked photo has officially been upended thanks to a picture of ... an egg. Yes, a regular stock image of a brown egg. It all goes back to Jan. 4 when the Instagram profile @world_record_egg uploaded its one and only post. "Let's set a world record together and get the most liked post on Instagram," the caption says next to the picture of the egg. "Beating the current world record held by Kylie Jenner (18 million)! We got this." Although the profile has a mere 2 million followers, the image of the egg received more than 26 million likes. The makeup mogul has 123 million followers. Jenner's former record-holding photo was from just under a year ago. She posted a photo of her daughter on Feb. 6, 2018, and wrote, "Stormi Webster." Baby Stormi turns 1 on Feb. 1 and her mom is already getting prepped for her birthday festivities. Losing out to the egg by more than 8 million likes, Jenner posted a clapback on Sunday night. She shared a video of a homemade meme showing her brandishing an egg that said, "Kylie when she sees the world record egg account." She captioned the video, "Take that little egg." "First, let's feel the ground," she told the camera as she touched the asphalt. Confirming that the ground was "really hot," she cracked the egg's shell on it and watched the egg bubble into a rather unorthodox sunny-side up. Moral of the story: don't dethrone the queen of Instagram likes. The egg photo may have her beat, but can this food item consider itself one of America's wealthiest celebrities? Didn't think so.